The Gray Baron butterfly, this male butterfly is not sunbathing, he is drinking. For several days now I have admired lovely bluish butterflies visiting our Malabar blackmouth (Melastoma malabathrica, Melastomataceae). They do not care about the blossom, but like human children and sooty-headed bulbuls they can not resist the black fruits. Browsing the butterfly book and trying to identify the butterfly by using the memory of a glimpse was not enough. Using my old butterfly net I caught a shabby old male and sat down before breakfast. I held the body (thorax) between my fingers. This part of the insect contains all the muscles for the four wings and six legs, and although the muscles are protected by the exoskeleton you can clearly feel how strong the butterfly is. It is like holding a living fish, vibrating of life of strength. This butterfly turned out to be a ‘Gray baron’ (Euthalia anosia anosia, Nymphalidae). The male is characterized by strongly and elegantly falcate wing tips, absence of any white or red spots and a gorgeous misty blue colour on the forewings which Pisuth Ek-Amnuay describes as ‘mottled greenish gray’ in his eminent book on Thai butterflies. 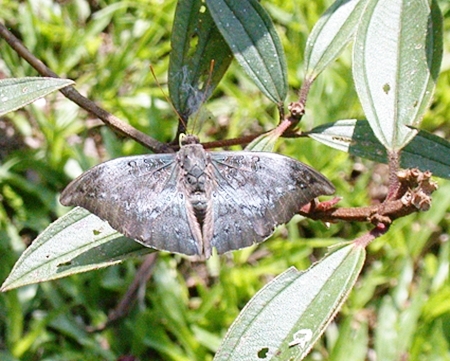 The female has a series of decorative white spots on its forewings. The undersides have clear patterns as drawn with black ink on a silvery gray paper. This species is new to Dokmai Garden but previously reported from Chiang Mai. I found no information about its larva and what plant it eats, so we have to keep exploring. My only problem is the English name, ‘Gray baron’. To me the butterfly appears blue, and ‘gray’ does not give justice to the beauty of the butterfly. I think something more distinguished would be appropriate. It looks old and clad with lichens, so why not ‘Forest baron’? www.dokmaigarden.co.th. [email protected]h.
A Crescentia cujete fruit maturing at Dokmai Garden in Chiang Mai this month. The green orb is the fruit of a calabash tree (Crescentia cujete, Bignoniaceae)! This small tree (up to 10 m) is commonly planted in Chiang Mai as an ornamental but originally it comes from the Caribbean, Central America and northern South America. It should be grown in full sun on well drained soil. Cuttings root easily and are used for making living fences. The tree makes beautiful green blossom straight on the branches (it is cauliflorus). I have no pictures but will provide next year. The name ‘calabash tree’ is derived from the fact its hard rind can be used for making vessels, cups and spoons. 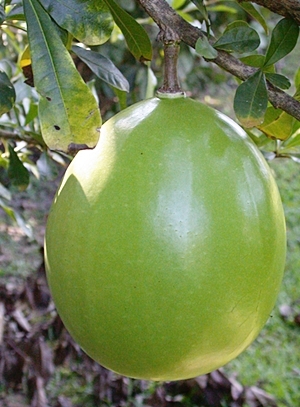 The original calabash is a vine from Africa (Lagenaria siceraria, Cucurbitaceae). Members of the bignonia family make very different fruits, such as flat edible sabers or long spirals. Many members of the bignonia family have winged seeds for wind dispersal, but not the calabash tree. It has been hypothesized that this fruit was once eaten by large mammals which were hunted to extinction by Native Americans. Today, horses seem to eat the fruits. I offered a slice of an immature fruit to our water buffalo, who likes banana and longan, but he rejected it. I threw in two pieces to our wild boars, and they fought over them. Then I sliced up half a fruit in eight pieces to give each piggy a chance, but then they just sniffed at the pieces and returned to me for something more tasty. The diameter of this smaller immature fruit was 138 mm, the weight was 900 g and the rind was 3 mm thick. The fragrance is like a combination of sand, Scleroderma mushrooms, radish and cucumber. The huge number of seeds are dispersed within the pulp. The pulp oxidizes gray and is easy to detach from the rind by using your fingers. It has a spongy texture resembling that of immature puffballs. It is not considered food by the native South Americans, but a medicine against asthma, fever and worms. The heart-shaped seeds can be mashed and mixed with water to make a refreshing drink.